This ancient Irish name is an Anglicized form of the Gaelic surname "O hIfearnain", the "O" prefix indicating "(male) descendant of", and the personal name "Ifearnan", a diminutive formation from the nickname "Ifreannach", demon, from "ifreann", hell. Traditionally, Irish family names are taken from the heads of tribes, or from some illustrious warrior, and are usually prefixed by "O", as above, or "Mac", denoting "son of". The original territory of the Heffernan sept was near Corofin in County Clare, called Muintirfernain after them, but they established themselves early on in eastern County Limerick, on the Tipperary border, and were chiefs there of Owneybeg; the (O')Heffernans are still found mostly in those areas. Old manuscripts such as the "Book of Rights" describe the O'Heffernans as one of the "four tribes of Owney", the others being MacKeogh, O' Loingsigh (Lynch), and O'Calahan. 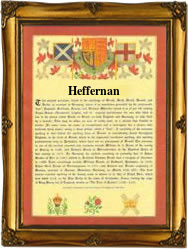 The modern surname can be found recorded as Heffernan, Hiffernan, Heffernon and Hefferan. A notable bearer of the name was William Dall O'Heffernan (1715 - 1802), the Gaelic poet. The first recorded spelling of the family name is shown to be that of Aeneas O' Heffernan, which was dated 1543, Bishop of Emly, during the reign of King Henry V111 of England, known as "Bluff King Hal", 1509 - 1547. Surnames became necessary when governments introduced personal taxation. In England this was known as Poll Tax. Throughout the centuries, surnames in every country have continued to "develop" often leading to astonishing variants of the original spelling.